Next on our list was this fun activity. As always, Pinterest was my saviour and I remembered finding a rockin' Pollock guitar challenge to fit in with our "Playlist" topic by Art with Mrs Seitz. We learnt about the artist himself and looked at some of his work. Some of the children were confused and felt that they could produce similar if not better art but others were able to appreciate it! To give the effect of a Pollock painting, we dipped string into paint using clothes pegs (to save us from extra messiness) and the children then laid the string across the guitar outlines that they had drawn and cut out from coloured paper beforehand. They could move around different tables to get different tables and overlap the colours. I was surprised by how effective this technique was and the class really enjoyed it. We glued the colourful guitars to black paper and then painted our background. I urged them to try to think of how they could convey movement and sound, some painted musical notes and others went for more abstract designs. The final stage, once the guitars were dry, was to glue on extra details such as string and tin foil (for frets and other guitar details). It was great having such an unstructured art lesson and I really felt that the children had a lot of creative freedom and room to express themselves. Here's how they turned out and thanks Mrs Seitz! We shared this project in our sharing assembly this week and I received lots of positive comments from staff afterwards. 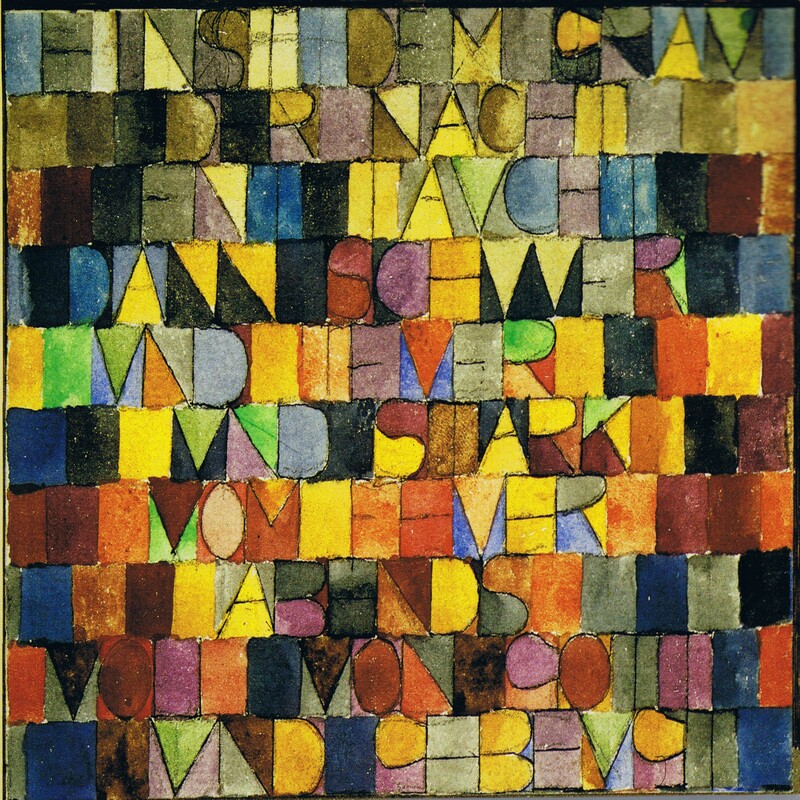 As our topic is Playlist, we looked into the work of Paul Klee who was heavily inspired by music for many of his pieces of work. His mother was a singer and his father was a music teacher. I came across a similar project here at Mrs Picasso's art room, but wanted to make an extra link to our topic by using song lyrics. We had previously set the children a homework task of thinking of a short phrase or few words from a song that particularly meant something to them. They came up with some wonderful ideas with inspirational messages. 1. To save time, I drew out a grid and photocopied it for all children. 2. They took their lyrics and wrote them out into the grid using a pencil, one letter in each box. I stressed for them to use up as much of each box as possible for the letter to make it stand out. 3. To colour, the children coloured the boxes without a letter in just with one colour and the boxes that did have a letter in would colour each section in differently. 4. The last step was to use a ruler and black marker to go over the grid lines and then the lettering to really make it clear. I would love to post them all but I don't want to overload you! They look brilliant and I'm so impressed that every single child managed to come out with beautiful lyrics. Well done everyone, especially those in the assembly and thanks to the parents who were able to come along to support! 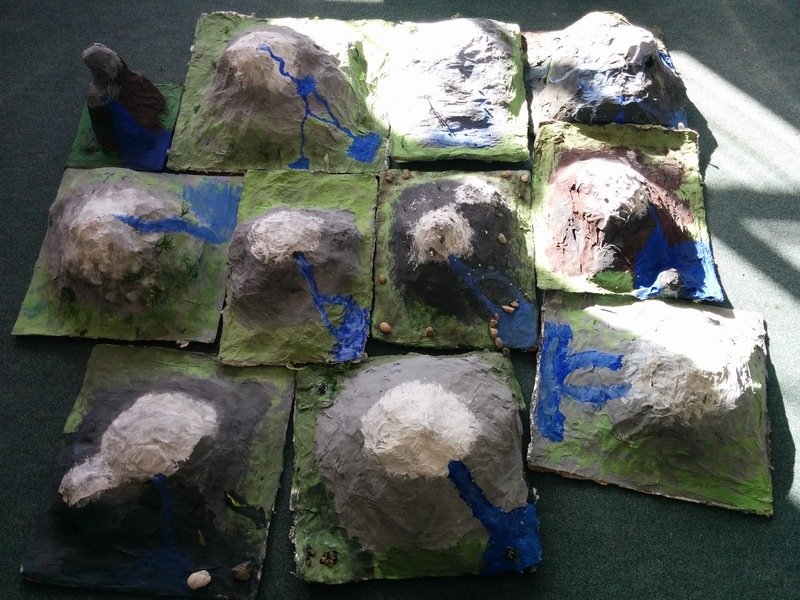 To finish off our latest topic, Misty Mountains, we set the children the ambitious task of creating their own 3D papier-mache mountains. They put themselves into groups of 3 and were fantastic at bringing in the materials that we asked for. The projects probably took about 3-4 full afternoons altogether but we are all so incredibly proud of the results. It's a shame we didn't have them finished in time for the parents' book look, but they'll make quite an impression when they get taken home later this week! 2. Using scrunched up pieces of newspaper, they made rough mountainous shapes by taping these pieces down to the base and layering them on top of each other. They could make any kind of interesting shape they wanted to provide a support for the next layers. 3. Once they were happy with their rough newspaper shape, tin foil was cut up and stuck over the top of the whole mountain shape. The foil could be given a shape that held itself together much better. 4. 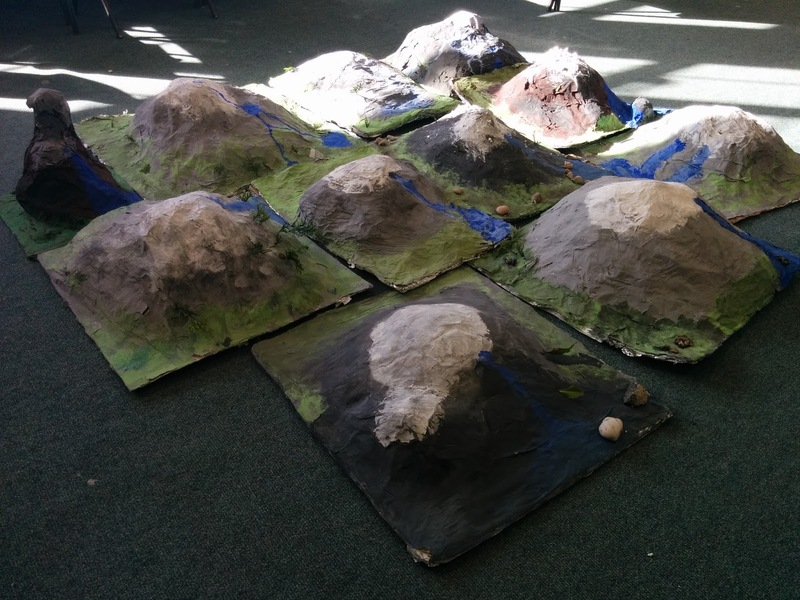 After being full covered in foil, the mountain was then completely covered in masking tape strips to hold it all together and to make a better surface for the papier mache solution. 5. We tore up a huge amount of newspaper strips and learnt about tearing along the grain of the paper to get neat tears. Water, flour and salt was then mixed to make a paste. The newspaper strips were then layered on top of the structure. This was left to dry overnight and harden. 6. We did a rough base coat layer. Some groups chose grey, brown and some went for a gradation of greys. 7. Once dry, each group was given blue, green, white and black paint. With these they could add extra details to their terrain and mix a range of different blues/greens by adding black/white which they understood because of their recent work on value. 8. Any final decorations were added. Some groups sprinkled over glitter to act as snow, others crumbled up polystyrene foam to act as the snowy part. Some groups added pebbles to act as boulders and rock formations, some added blue ribbon and beads for their water. A clever trick that some groups opted for was picking evergreen leaves. They then pricked a small hole in the surface using a pencil and glued to leaf into the hole to make it look like a tree. Very effective! Brilliant project everyone and I can't wait to share these with the rest of the school in our assembly on Friday.